One proposed parking solution is to designate 11 of these 19 spaces as 3-hour spots for downtown customers and people with employee parking permits. Downtown parking near the Albany Carousel and the post office continues to take up the city council’s time. The council Monday reached no conclusions but agreed to again seek possible solutions at a work session in two weeks. The carousel, open since Aug. 15, is looking for ways that its volunteers, some of whom are said to be elderly, don’t have to hunt for a parking space when they arrive for their three-hour shifts. Steve Reynolds, speaking for the carousel, told the council the organization does not want volunteers hit with parking tickets. Downtown parking enforcement is run by ParkWise, an arm of the Albany Downtown Association. Lise Grato of the association told the council she suspended enforcement while the council considers the issue. On Calapooia Street on the west side of the Albany Post Office, the city this year built 19 back-in angled parking spaces where there had been eight parallel spaces before. 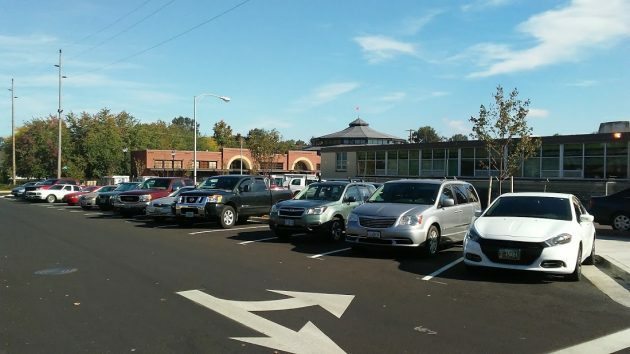 Mayor Sharon Konopa favors designating at least the additional 11 spaces for three-hour parking by either customers or employees. Those 19 spaces, according to the Downtown Association’s Grato, are always full on non-holidays, and current users include five employees from the nearby Loafers restaurant, nine to 11 postal workers, one or two carousel “team members,” and one or two employees working in the Raybar Building one block to the east. On Second Avenue at the post office, the back-in angled parking is rarely used. Among possible reasons, Grato said, is that people fear getting a ticket if they have to wait in the post office line for more than 30 minutes. She suggested that the time limit there be raised to three hours. That would also allow parking by visitors to the Monteith House, the carousel, and Loafers. From Councilman Rich Kellum came the idea that with bus service from Heritage Mall, volunteers could park there and catch a bus to their carousel shifts. 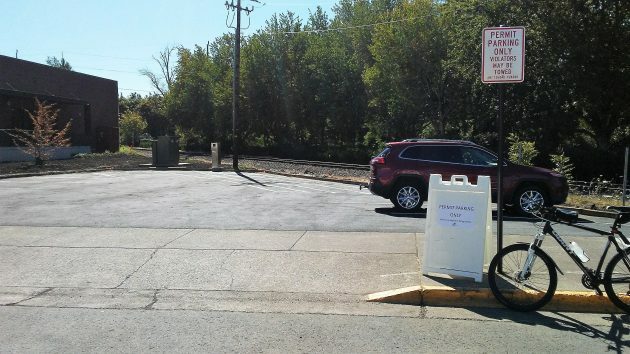 When the carousel opened, the city parks department put up signs deterring parking at the nearby Albany Senior Center and Monteith Riverpark for anything other than visitors to the park or senior center. On Aug. 16, this city-owned lot next to the carousel was all but empty, but parkers without permits were threatened with being towed. If you want volunteers to help in keeping operating costs down you need to make it beneficial to them to assist. Making them ride in from distance far away is not an answer. Our time is important to us. Help the volunteers out and give them access to areas close enough to the carousel to show appreciation for their time and devotion to the cause! I live on 5th and Calapooia. There is plenty of open downtown street parking withing 3-4 blocks of the Post Office, Carousel, and Loafers. This is in the residential area (my house is 3 blocks up) and in the business area. I don’t see many people using a shuttle service from the Heritage Mall to the Carousel, as it would be much more convenient and quicker to simply walk the 3-4 blocks. It seems like a poll was taken, according to Hasso above, and 18-20 of these spaces are used by local employees. I may be old fashioned here, but could we not have the businesses in this area encourage their able bodided workers to park further away, leaving more parking areas near these places open for both customers and those employees who have difficulty walking 4 blocks? So they volunteer and you want to make it inconvenient for them? I’ve heard this shuttle idea mentioned a couple times, it’s a terrible idea. If it’s not convenient people wont do it. If you want people to use the carousel and the downtown area in general you need to come up with a good fix. A shuttle is not it. Note: While I came up with the idea to park at Heritage Mall, Mall manager Betsy Penson offered the space for the volunteers to park and ride the bus to the Carousel while there is space available. Let’s designate city hall parking lot “carousel parking” and run a shuttle service back and forth. Able bodied city employees could park several blocks away and just arrive early so they could walk from their vehicles to city hall. I certainly didn’t say “make special parking for the carousel”. I said there needs to be a good fix for the area. A shuttle is not a good fix. “Your job” is to address these things before they become a problem. Councilor Kellum was not responsible for the initial decision regarding Carousel siting. Councilor Kellum is not about to take any responsibility for solving problems created by the governing body regarding the carousel-parking crisis. Seems like the perfect Politician. I am proud to be a citizen of the Third Ward in Albany, Councilor Kellum’s Prefecture. Councilor Kellum seems to be reviving the Do-Nothing Movement and should be congratulated for his “no responsibility” position. The parking problem is NOT an “unintended consequence” that is such a frequent excuse in politics, etc. today. This was absolutely foreseeable.Yes, the city bears responsibility. They promoted, financed (with our money) and tried to tell us that this would bring thousands of tourists to Albany. Did anyone on the Council ever think that the location is far from convenient for “tourists”? Now, that the parking problems are evident, the city feigns innocence. Just wondering, is the carousel privately owned like, Novak’s, First Burger, etc? And, by the way, in order to provide a shuttle (even if that made sense) that puts even MORE of the tax payers money into this venture. Who’s going to pay for vehicles and employees to run the shuttle? Add-up the costs and benefit expenses that would be involved. Yes, it is. It’s not a city operation. The Albany Historic Carousel and Museum is a private 501(c)(3) organization, but received approx $750,000 from CARA. So the facility is not currently owned by the City. But the real question is degree of control. It is naive to think that $750,000 of a political slush fund was given without some strings attached. Thats funny because I get the feeling the City thinks it’s the Post Office problem to provide parking for the carousel. To this outsider it looks like “carousel” is the perfect metaphor for the city council. Imagine if this project was a privately-owned apartment building. Without an adequate parking plan the project would have never made it out of city hall. But the rules are different for non-profits who feed at the public trough. Clearly, some organizations are more equal than others. Why don’t they buy the old post office and make a parking lot right there? The Post Office needs a new building/spot, anyway. I like Mayor Konopa’s idea of designating 11 spaces on Calapooia for parking for customers or employees but why not designate all 19 spaces, and why does there have to be a three hour limit? Employees of the post office particularly need parking for more than three hours like they had before the carousel was built. The post office brings more people to the downtown area on a daily basis than the carousel does. The post office should be taken care of, not pushed out. Maybe five or six spots should be designed for the post office. Interesting…when a business builds it is required by the City to provide a minimum number of parking spaces for it’s customers. But, no similar requirement for the carousel project ? No. In the downtown parking district, all construction projects are exempted from providing off-street parking. The district was created in 1972 and assessed an annual tax on all owners within in. The money was used to provide off-street parking lots and maintain them. As part of creating the district, the city removed parking meters. The council canceled the district in 1992 as part of a larger code revision that also, interestingly, repealed a city human relations commission that was to work against discrimination and so forth. While the parking district no longer operates, the development code still exempts owners within it from off-street parking requirements. Thanks for the history lesson. After reading it, I didn’t know whether to laugh or cry about the current dilemma. What if right side parallel parking spots were changed to pull in diagnal parking spots on 1st,, 2nd, and 3rd with the exception of the 1/4 block near the interesctions needed for turning lanes. Also could folks use the bank lots and other downtown business and city lots after regular business hours, and just have 5 or 6 designated parking spots for city employees after hours, and not the entire lot? Can the parking at 3 Rivers be re-striped to perhaps allow for more spots??? While this may not solve all the issues it would certainly help during the weekends and provide just a few more useable spots . . .
Why is it that parking is an issue now? Where did all the volunteers park before the carousel was built? Dumb question maybe, but just curious. I find it very interesting that this is an issue now. When the carousel was being built, we were expecting lots of tourist to come and visit it. Where the heck did we expect them to park? Hello? If we want the tourist dollars, we might actually want someplace for them to park. A parking garage at Two River would be helpful for all the businesses downtown, including all the fine restaurants, the Pix and the Carousel. Why can’t CARA funds be used for something like that instead of so-called “beautification” projects?